Our 'pour boys' wine team gathered for a festive holiday dinner that featured an extensive wine flight to pair and compare. We were joined by Bob L, Mark and Shirley. 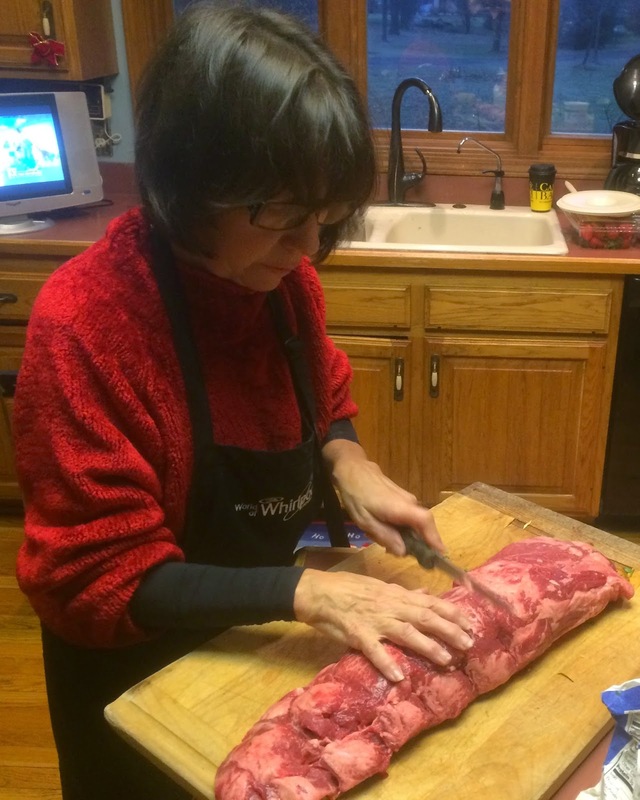 Linda prepared a spectacular Beef Wellington Tenderloin dinner. 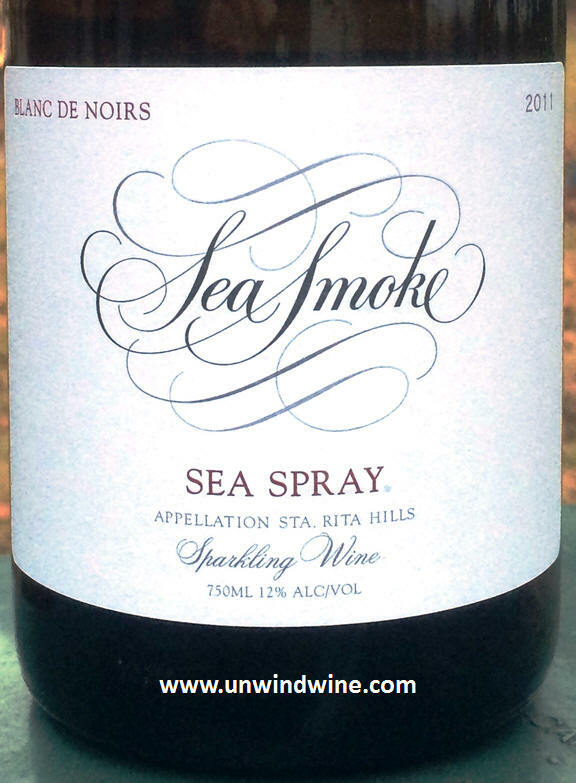 To kick off the evening Bill brought a Sea Smoke Sea Spray Blanc de Noir Pinot Noir based sparkling wine. 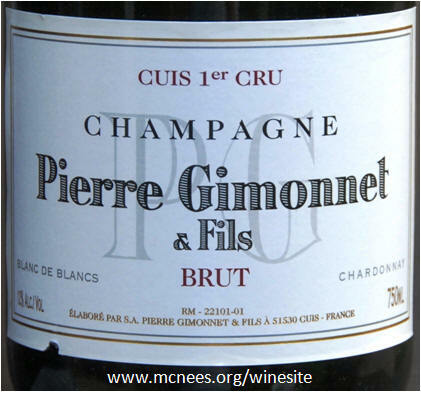 I pulled a Pierre Gimonnet Champagne Brut Blanc de Blancs to compare. These were paired with fresh Driscolls raspberries and strawberries, shrimp cocktail and a selection of artisan cheeses, and deviled eggs, meatballs, and shrimp brought by Lyle and Terry. 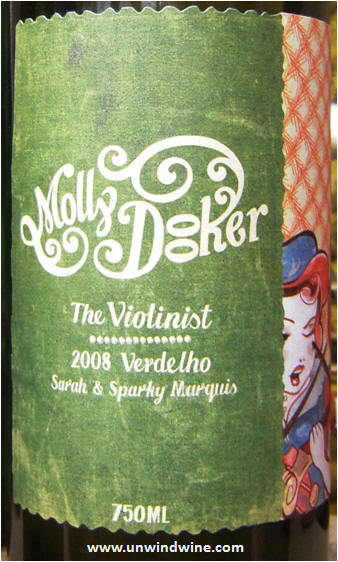 The white wine flight continued with Mollydooker 'The Violinist' Verdelho 2008. 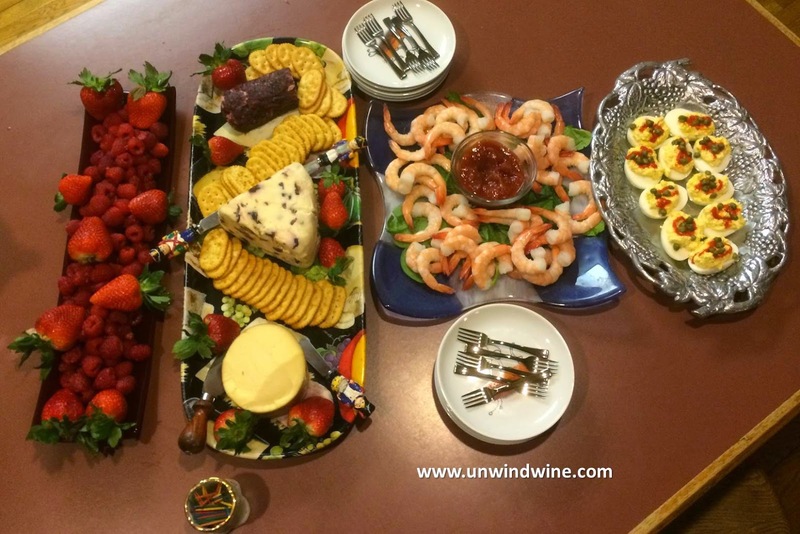 The cheeses included Stilton with Cranberries, Floralie Goat Cheese with Cranberries and Cinnamon, Smoked Gouda, and Expresso laced Bellavitano. 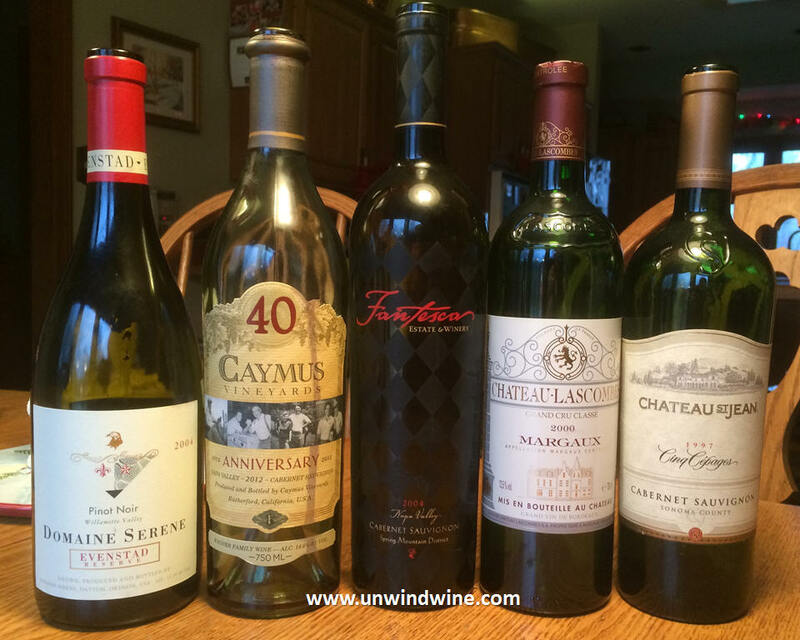 We kicked off the red wine flight with Domaine Serene Evensted Reserve 2004, followed by Caymus Estate 40th Anniversary Cabernet Sauvignon 2012 for the pre-dinner pairing flight. 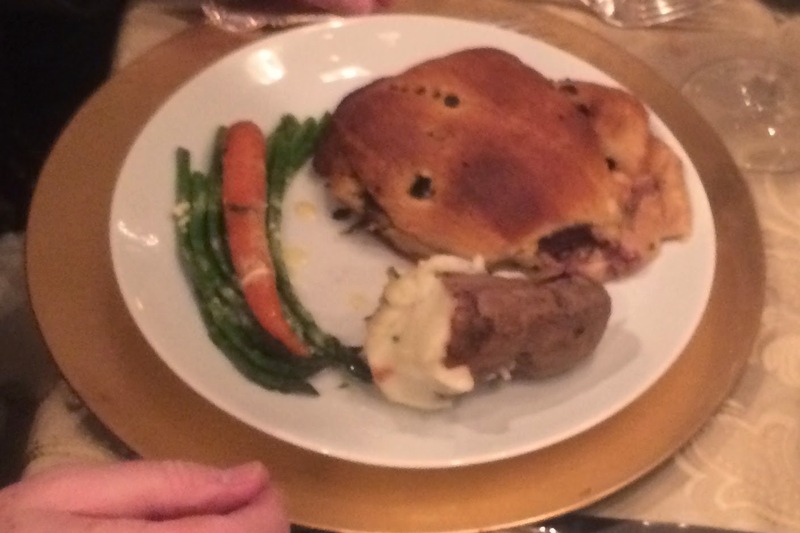 For dinner, following caprese salad, Linda prepared extraordinary individual beef wellington tenderloins accompanied by roasted carrots, asparagus and twice baked potatoes. 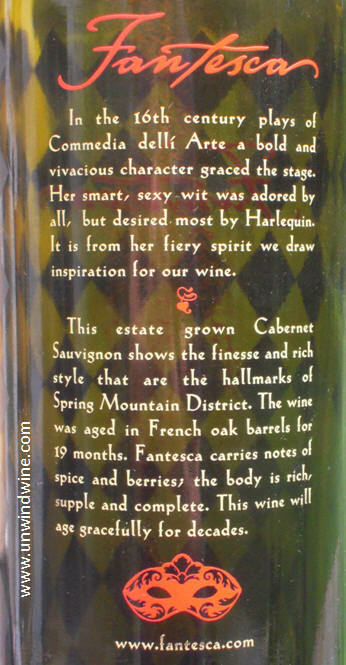 With dinner we opened the elegantly packaged etched glass bottle of Fantesca Estate Spring Mountain Estate Cabernet Sauvignon 2004 which set the stage perfectly for Chateau Lascombs Margaux 2000 with their similar central core of bright black raspberry fruit. Following the Bordeaux blend, Lyle had brought a Chateau St Michelle Cinq Cepages 2010, but we pulled from the cellar an aged 1997 release to compare with the aged Lascombs instead. Following dinner, with coffee, Linda served Turtle Cheesecake and a carrot cake roll, with Chocolate Caramel Truffles with sea salt brought by Bill and Beth. With the dessert course, we opened a dessert wine flight of three aged disparate varietals and styles from three different regions - Austrian Herbert Triebaumer Ruster Ausbruch 1996/97, Italian Cavalchina Passito Veneto IGT 2004, and Hungarian Royal Tokaji Wine Co. Tokaji Aszú 5 Puttonyos Birsalmás 2000. 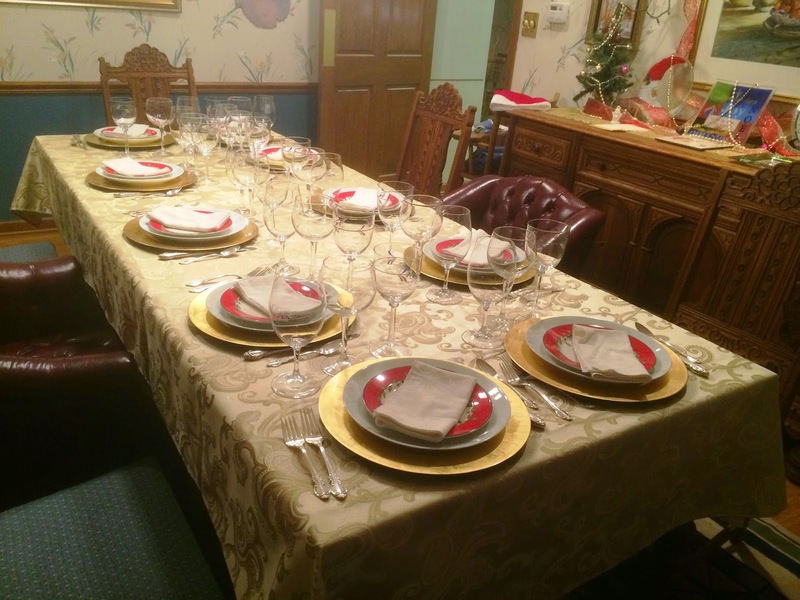 Part of holiday tradition is to serve sparkly bubbly wines as part of the festive holiday celebration. Bill's vintage Sea Smoke Sea Spray set the bar for this Sparkling White Wine flight. Of course authentic refers to the fact that only wine produced in the méthode champenoise sourced from grapes from the French Champagne region in northwest France is legally and appropriately labeled Champagne. Champagne is typically sourced from Pinot Noir or Chardonnay. Bill's Blanc de Noir is named such since it is sourced from Pinot Noir while this Blanc de Blanc is name for its Chardonnay sourced varietal. This provided a great comparison tasting to two varietals from two sides of the world. The name Sea Smoke refers to the fog that drifts inland from the nearby ocean that graces the vines and cools them at night providing some relief of the midday sun and heat. The producer Sea Smoke and the Santa Rita Hills appellation on the south central California Coast are both known for Champagne and Burgundy varietals, premium Chardonnay and Pinot Noir. Bill's tasting notes from Cellartracker - "A delicious complement to quiche, ham and biscuits for Christmas morning brunch. A beautiful blush color, this Pinot Noir based sparkler from Sea Smoke is rapidly becoming one of our favorites. Crisp and clean with a medium body, there is a hint of grapefruit on the palate which is nicely balanced by notes of yeast. 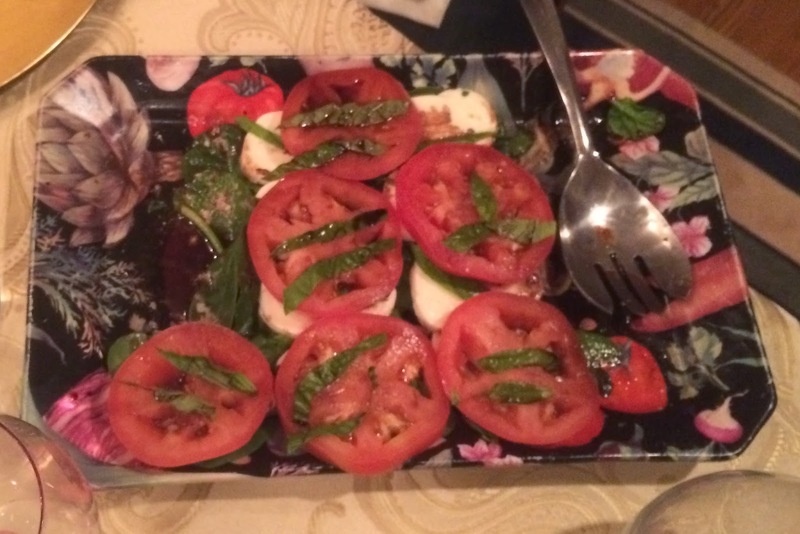 A bit pricey but delicious." Like last year, this 1st Cru Champagne is part of a case we acquired several years ago. Sourced from anywhere else, bubbly is simply 'sparkling wine'. This Champagne is NV, non-vintage, or a blend of fruit sourced from multiple years or vintagers. Champagne producers do this to maintain a more consistent branding in their wines, moderating the effects of variations from vintage to vintage. Only the most premium selections are 'declared' a vintage designated specific bottling. We visited Champagne during our Champagne Wine Experience 2006.
one of the most popular grapes planted on the small island of Madeira where vines were first planted in the 15th century. The variety produces highly acidity wine if they are aged, but when drunk young they provide some of the most fruit filled flavorful wines of the Madeiras. It is now a popular grape being widely planted in the new world wine regions from Argentina to South Australia. No wimpy white wine here. Medium bodied, a cross between the body of a chardonnay and the crispness of a sauvignon blanc - full essence of pear predominates with subtle citrus, melon and tropical fruits on a mildly acidic full mineral finish. 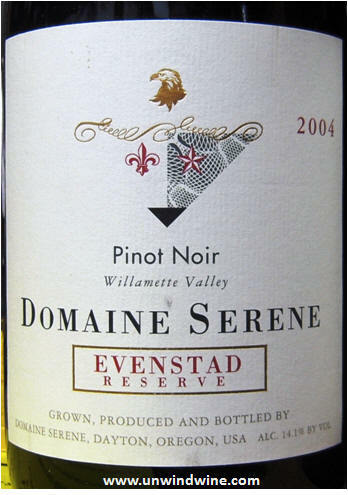 One of our perennial favorites although if you read this blog you'll know we don't do a lot of Pinot Noir compared to other varietals. Domaine Serene produce at least three ultra premium priced Pinots above this one, none of which have I tasted. I look forward to doing so at some point as I love this wine. I am not a fan, however of their lower priced entry level offerings including Yamhill Cuvee. But then I've often written how elusive is a low priced high QPR Pinot Noir. The fruit was more subdued than I remember. At ten years old, I wonder if this is past it prime drinking window or just a more subtle vintage release. Dark garnet colored, medium bodied, the black cherry and black raspberry fruits are a bit subdued and compete with tones of leather, earth, anise, spicy cinnamon with a touch of smoke and oak on the moderate tannin finish. 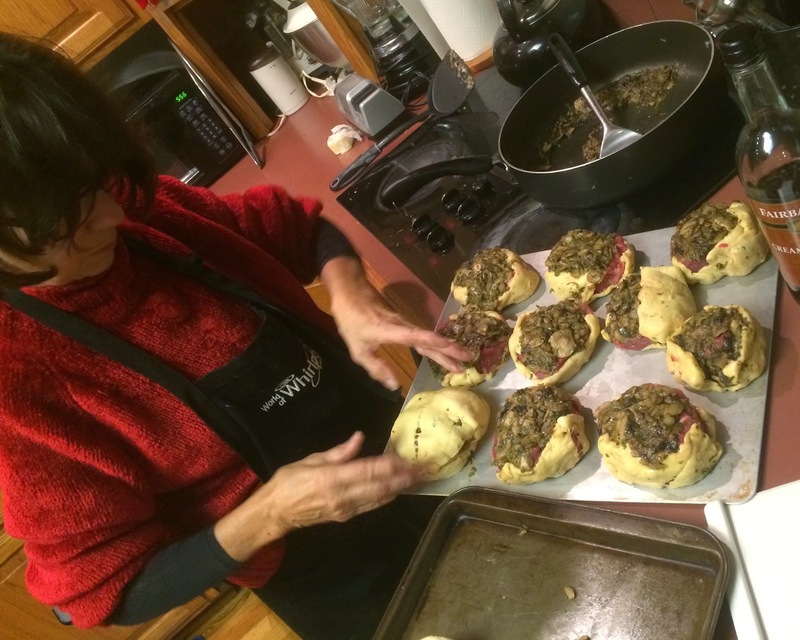 If you read this blog often, you've probably already seen me praising this amazing wine. 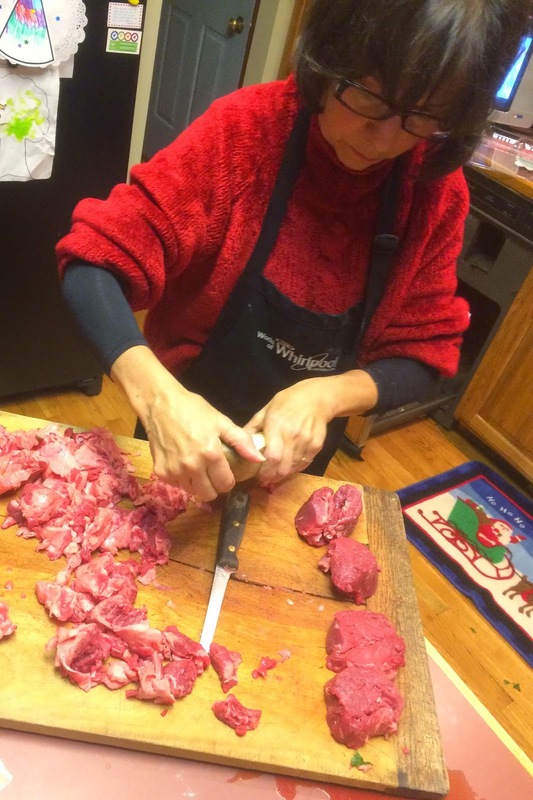 As I've written here several times, the 2012 vintage of Caymus Estate Cabernet Sauvignon is spectacular and was a perfect compliment to our cheeses, tenderloin beef steak dinner and dark chocolate truffles dessert. Not only did they release a blockbuster for the vintage, they packaged it in a celebratory bottle and commemorative label, and then they lowered the price! A wine that typically sells at the street price of $65, this was widely available at ten dollars off the regular price or $55 at release. The street price has now crept up to $59. For drinking now or saving for a couple years, this is a great buy for the price point, and for special occasions or anniversary celebration dinners. And for better value, they also offer a one liter bottle. This is a showcase wine that shows Napa Valley Cabernet at its best with consistency, early gratification and moderate aging potential. As featured in my recent earlier blog journal tasting reports on this wine, this is the 40th release of this legendary label and it features a special 40th Anniversary release label for the occasion. The 2012 vintage release also shows the classic characteristics of Caymus Estate Cabernet at its best - early approachability and drinkability as a young wine. Typical legendary Caymus Cabernet style - dark blackish ruby/garnet colored, medium bodied, nicely structured, complex but smooth, well balanced and polished, it opens with sweet ripe blackberry and raspberry flavors highlighted by layers of milk chocolate, subtle tones of cinnamon, vanilla and hints of caramel and kirsch, giving way to a smooth lingering modest tannin finish. Against the more elegant and complex Fantesca and the sophisticated blends, this appeared much more one dimensional that when consumed standalone. To compare against the Caymus Napa Cabernet and to set the stage for the Chateau Lascombs we opened this 2004 Fantesca Spring Mountain Napa Cab. We visited Duane and Susan Hoff at their spectacular mountainside estate of Fantesca Spring Mountain Estate and Winery during our Napa Wine Experiences in 2007 and in 2009. With their elegant etched glass bottles, we enjoy serving this wine at special occasions, and we love their sophisticated and elegant wines too. This was the first vintage release under their ownership. 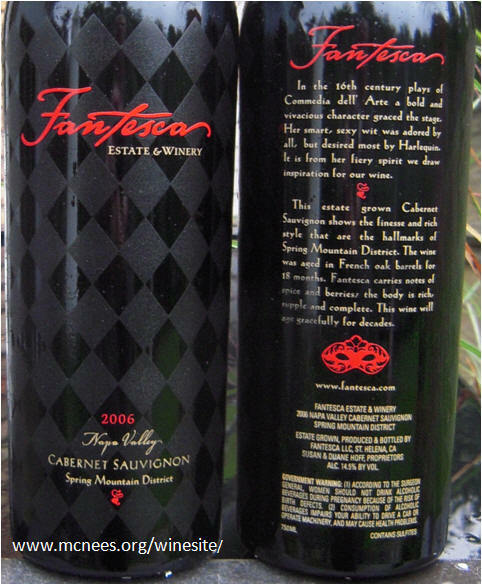 Returning to the '04 Cabernet, the Fantesca was medium-full bodied, dark garnet colored, complex but smooth and polished with bright forward fruits of black currant, dark berry and black raspberry, accented by sweet dark chocolate, a hint of cassis, and a tone of spice on the lingering refined tannin finish. Bill shared this classic aged Bordeaux Margaux from a classic vintage from his cellar. At fourteen years, this exhibited more subdued fruits and floral than earlier tasting two years ago. I wonder if its just entering an 'closed' period in its aging or perhaps we didn't allow it enough time to open. Often, such sophisticated and complex wines need a whole day to open to truly reveal their native character and profile. Decanted but aged for about and hour to ninety minutes, this showed medium-body, deep ruby/purple-color, opening to a classic Margaux bouquet of earthy floral with flavors of earthy, leathery firm blackberry, black currant, and black cherry fruits with a layer of tar, vanilla and moderate tannins on a long, berry, soft oak finish. We debated about what to open next following the Lascombes to pair with the tenderloin and compare with the Bordeaux Blend. This mating dance of flight selection that we go through at such dinners is a great part of the fun. Having a deep cellar with lots of choices allows us the option to design the flight based on what the guests happen to bring. Lyle brought the most recent 2010 release of Cinq Cepages California Bordeaux blend. 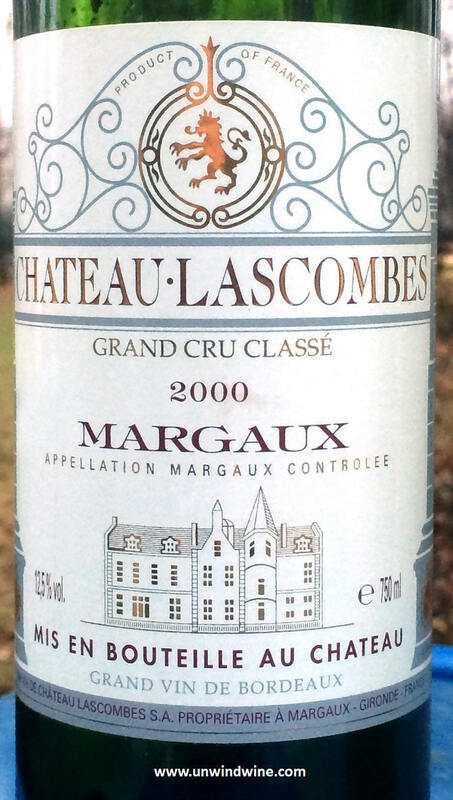 We considered pulling from the cellar another younger vintage of the Lascombes, but following the 2000 Lascombes blend, we opted to open an older 1997 Cinq Cepages release instead. We pulled this from our vertical collection that spans ten vintages of this classic wine that was wine of the year with its 1996 release. Cinq Cepages means 'five flavors' ala a Bordeaux style Meritage blend. There was still much life left in this seventeen year old - medium bodied, vibrant bright black raspberry, red currants and kirsch flavors highlighted by a layer of tea and hint of caramel and touch of spice on a moderate short light polished tannin finish. We finished with three dessert wines from different regions with contrasting styles and profiles. These were no doubt straw colored upon release, over time they darkened to butter color, then weak tea colored, eventually darkening to the dark orange rust color they possesses now. 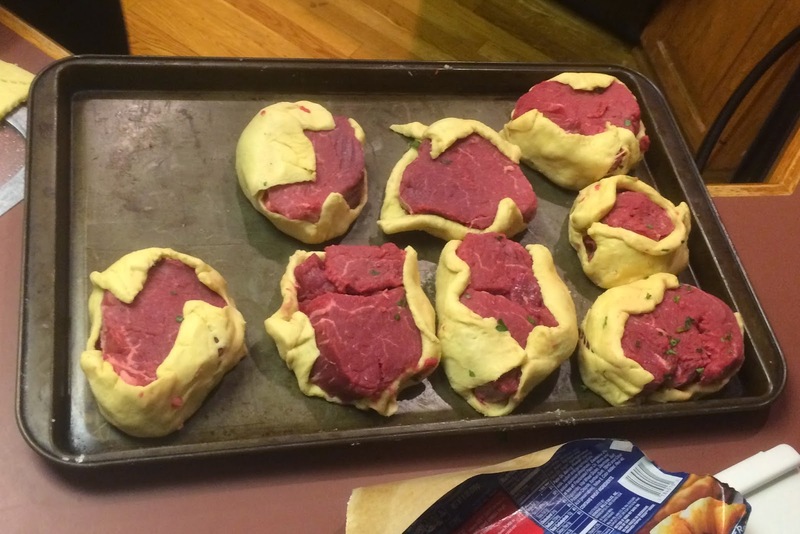 Allowed to continue to age, they will likely eventually darken to dark strong tea color, and then maple syrup color, although I suspect none will necessarily improve the flavor and suitability of the wine. 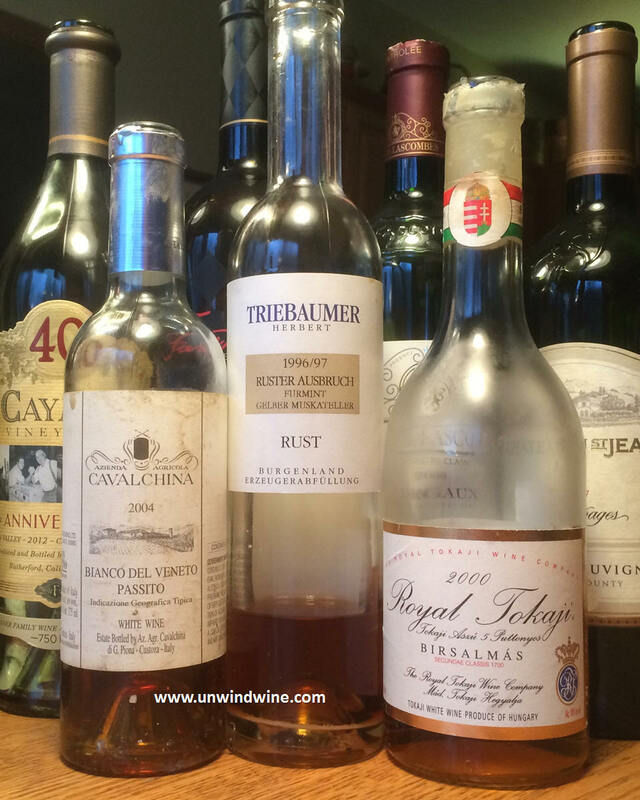 Some classic dessert wines are built to last decades, I suspect none of these will improve further and the Ruster Ausbruch and Cavalchina Veneto Passito are likely at or even past their peak drinking window. All were moderately priced high QPR values enabling a triple treat comparison tasting such as tonight. Burnt orange colored, medium full bodied, sweet apricot with tones of peach turning to pink grapefruit citrus on a tongue coating smoky almond finish. 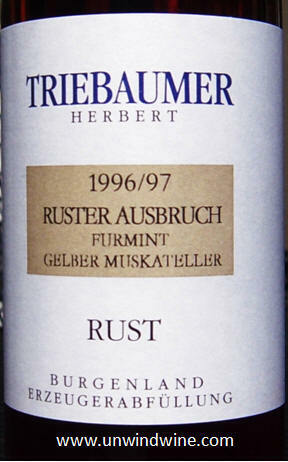 We still have a case of this wine, so stay tuned as we monitor this over the coming months and years. This is a Chardonnay blend. The thick almost syrupy extracted sweet fruit was offset by a smoky roasted almond nut flavor. Rather than the highly desirable apricot or peach flavors, this tended to be more citrus focused this tended to be more citrus focused with a tone of tangerine predominating. Medium-full bodied and thick - apple fruits, subtle tangerine, hint of apricot and peach flavors are overtaken by wet wood, smoke and nut on a full flavorful lingering finish.